My favorite new cheese discovery is creamier than the softest brie and as funky as a ripe wedge of blue. It’s delicious spread on crackers, and I hear it makes for a mean mac ‘n’ cheese. Here’s the thing: The tofu misozuke made by Rau Om, a Belmont, California-based company, isn’t really cheese at all. The product is, as its name suggests, made from tofu that has been cured with miso and allowed to age for two months. For vegans and other people with dairy restrictions, the tofu misozuke is about as close you can come to experiencing the real deal — not just any cheese, but the long-aged, intensely flavorful, and delightfully stinky varieties sold at high-end cheese shops like Oakland’s Sacred Wheel Cheese Shop (4935 Shattuck Ave.), the product’s only East Bay purveyor. Rau Om’s tofu misozuke is the creation of the company’s founders, Dang Vu and Oanh Nguyen, two scientists in training who reverse-engineered the product while they were graduate students at the University of Michigan. The couple first tasted the traditional Japanese delicacy during a trip to Tokyo, at a random sake brewpub that they’d stumbled upon. “We thought it was really cool that there was this niche in the Japanese food ecology for something like cheese — but because they don't use dairy, this was what came up,” Vu recalled. When they came back to the States, they had a craving for tofu misozuke but couldn’t find it; in fact, hardly anyone they spoke to had even heard of it, even within the Japanese-American community. Vu said that to his knowledge tofu misozuke is somewhat obscure even in Japan itself — at least outside the island of Kyushu, where it’s especially beloved. So, being good scientists (they’d both majored in biology as undergrads), Vu and Nguyen decided to recreate the stuff themselves. This was back in 2008 — it took about three years of experimentation before they came up with a recipe they were happy with. 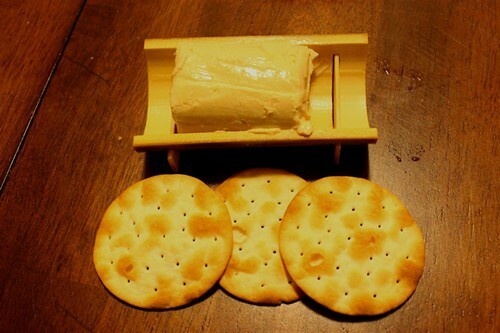 Tofu misozuke and crackers — a natural pairing. Vu explained that the basic technique is to press all the water out of block of firm tofu and cover it with miso. Then, the tofu is allowed to age in a carefully controlled environment for a period of at least two months. Over time, the salt and enzymes in the miso break down the proteins in the tofu and effectively cure it, resulting in an end product that is intensely flavorful and amazingly creamy. Recently, I stopped by Sacred Wheel to pick up some Rau Om’s tofu misozuke, which comes on a cute little wooden tray and isn’t inexpensive ($8.50 for a small log). What surprised me was how easily the tofu could be spread, even straight out of the fridge, and how intense the flavors were: salty, sharp, and extremely pungent, with just a hint of sweetness. If you’re someone who thinks of tofu as being bland and spongy, you won’t even recognize this. My wife and I ate it on water crackers, polishing off most of the log in a matter of ten minutes. Of course, many practitioners of Asian cookery are already well versed in tofu’s potential to exhibit cheese-like qualities. Stinky tofu, the popular Taiwanese/Shanghainese street snack, is legendary for its cheese-like putridity — Bizarre Foods’ Andrew Zimmern has likened it to “hot sizzling Limburger cheese.” And the closest analogue I can think of for tofu misozuke is fermented bean curd — those pungent (and sometimes chile-marinated) cubes that come in a jar and that Chinese people like to eat with plain congee. 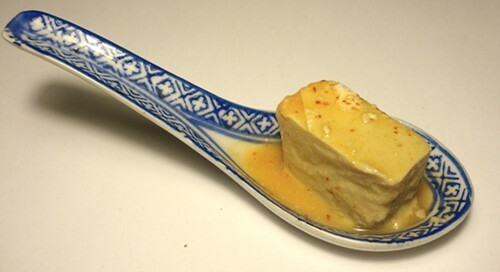 Use tofu misozuke in place of fermented bean curd (pictured) the next time you eat congee. Tofu misozuke is creamier and isn’t quite so salty — all in all, it’s a more complex and elegant product, but, as noted, it, too, is not without its funk. If you’re someone who’s had to give up your stinky cheese habit for whatever reason — well, tofu misozuke just might be your salvation. According to Vu, the traditional way to eat tofu misozuke is just by itself, using little wooden spoons, like the kind you sample ice cream with. He likes it with crackers or bread, too, or spread on a slice of cucumber, topped with a spring of spearmint or lemon balm. It’s also good paired with sake or soju — after all, in Japan, the product is usually served in a bar or izakaya setting. And Vu said that customers often tell him about creative recipes they’ve developed: a vegan tofu-misozuke mac ‘n’ cheese, for instance, or olives stuffed with tofu misosuke. A couple of high-profile East Bay restaurants have even featured the product on their menus. According to Vu, Ippuku (2130 Center St.), the sleek Berkeley izakaya, has served Rau Om’s tofu misozuke the traditional Japanese way, just plain. And Vu recalled that nearby Gather (2200 Oxford St.) used a dollop of it to finish a bowl of gazpacho — the tofu misozuke taking the place of sour cream. I reached out to the chefs of those restaurants for comment, but didn’t get an immediate response. It doesn’t appear, however, that tofu misozuke is on either restaurant’s current menu.